2014 KTM 125 EXC SixDays. Picture credits - KTM. Submit more pictures. 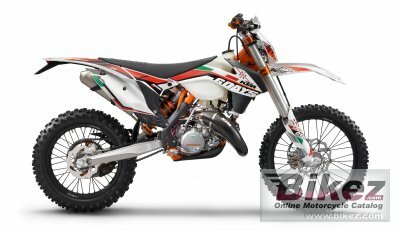 A whole package of high-quality special options makes the 125 EXC Six Days 2014 fit for this ruthless contest, in which more than half the starters bank on KTM every year. KTM 125 EXC Six Days - only authentic with the orange powder-coated frame of the KTM Factory Team. No other brand is anywhere near as strongly and successfully represented in offroad sport as KTM. Ask questions Join the 14 KTM 125 EXC SixDays discussion group or the general KTM discussion group.